Praise to Bill and Melinda Gates who, through their foundation, have focused on three primary directives: Ensure that more children and young people survive and thrive; the global eradication of diseases that affect the poor; and improving education and opportunity for at risk people. Praise to Mark Margulies, Boston-based Architect, who, through his focus on one issue, homelessness in Greater Boston, has made a huge positive impact on the homeless in our fair city. Praise to Donna Park, brave and committed Cincinnatian who works through the Catholic Church, on World Peace. Just as I struggle to have one “style” that is predictable for clients, I have struggled to find one “cause” into which I could pour my charitable efforts. I appreciate many “styles” because being open to many possibilities means there is a better chance for a fantastic solution. It may be why the practice is so diverse, perhaps. Likewise, my heart is drawn to so many good causes, local, national and international,because I feel like they help the communities to which I am attached, including the Global Community(isn’t that everyone?). Since I think that no one entity has a lock on good ideas, I support the idea that if we have enough groups working on the same issue (think Cancer research), perhaps we will find,collectively, the solution to any challenge. 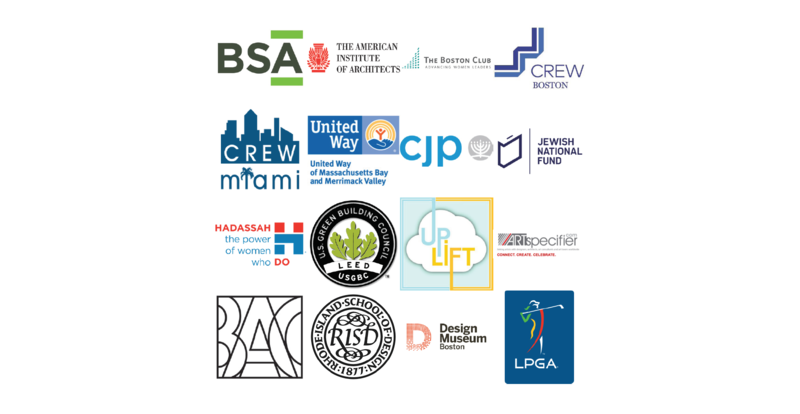 Our professional design community through Boston Society of Architects (BSA), a chapter of the American Institute of Architects (AIA). I am active in the Women Principals Group and I support the BSA foundation. The executive women in business community through the Boston Club (affiliated with ION). I am active in the social dinner group, the Cambridge Affinity Group, one of the Third Age Groups, part of the Membership Committee, helping to on board new members, Liaison to the Rising Generation Committee and the Diversity Inclusion Committee. The women in real estate community through the commercial real estate women (CREW)organization where I am a member of both the Miami and Boston chapters. I have been very active over the years, although less so more recently as I have become more involved in the Boston Club. CREW Boston honored me with its Entrepreneur of the Year in 2007. I remain active in the CREW Boston Entrepreneur Exchange. Our local Boston disadvantaged community through United Way of Eastern Massachusetts. I was part of the RE and Construction Industry Breakfast Committee for many years. My personal religious community through Temple and through Combined Jewish Philanthropies, which is kind of like a local Jewish United Way. CJP is an amazing organization and a current client! The non-profit organizations who serve local and international environmental, educational and healthcare needs through JNF, Hadassah, US Green Building Council (USGBC) and others. Pay it forward / mentoring others through helping young people who seek me out about their careers and interest in architecture and interiors. I support between 1 and 3 young women each year. Helping artists make connections with galleries, consultants, and clients as well as with each other. Joyce Creiger has a website called Art Specifier where she supports artists around the world who want to sell their art. I also have made introductions of artists to local galleries and tour clients. Serving the students and Alumni of the Boston Architectural College (BAC) and the Rhode Island School of Design (RISD) through portfolio review and hiring student interns. I also am a member Emeritus of the Board of Overseers of the Boston Architectural Center. Being available to friends and family for whatever is needed. And taking them to museums! Art is soul-building. (Shout out to the Design Museum Boston’s slogan, “Design is Everywhere”). So many friends need that little push to meet at a museum. We get inspired, then we have lunch.What could be better? And when all else fails, I facetime with my granddaughters Charlotte and Penelope. I also serve myself through a lifelong commitment to learning and following my natural curiosity. (See previous blog post, “What is your Inspiration?”). We will be no good to others if we don’t take care of ourselves. I also challenge myself through golf, cooking, intro to Spanish lessons, sketching (my mantra, often quoted: “You can’t see without sketching and you can’t sketch without seeing”). There is always more to learn! One of my biggest challenges is continuing to write this blog. I hope to get back to my book soon. I know I can’t do it all, but if my life is to have a lasting legacy or meaning, it can’t be just about our paid work, joyful that it is. Life is complicated and we do the best we can to improve our lives and the lives of others. Sometimes we can give help and sometimes we need help. It’s okay to NOT be perfect on all fronts all of the time. It must be these overcast grey days recently that increases contemplation of the meaning of life – the most corny, trite question that has no authoritative answer. It’s time to celebrate our humanity, imperfect as we are, and work together to repair the world and make it a better place for ourselves and for the next generations. What and who are you serving? Tell us about your communities.